This weekend I have decided to double-up on my blog posts since I did not get one posted last weekend. The feedback that I am getting on my reflections and recipes is really satisfying and I love that I am able to help others maximize a healthy lifestyle. I am hoping to keep up the momentum and continue sharing weekly. Not only do I love hearing from friends, family (and even strangers) about how they find my posts useful, but I must also mention that I have lost 7.2 pounds since the new year. Writing Produce keeps my health goals front and center and connected to a plant-based meal plan. Once summer comes, I am really looking forward to increasing my weekly posts. I tend to get a bit depressed in the summer when I am off work (especially the first month) so I am hoping that Produce will help give me a purpose and help me manage my time more wisely. Thank you to all that have been following along. I am really grateful for your feedback and interest. In the past couple months I have received multiple messages from my former high school students, friends, and family who are trying Green Smoothies for the first time. It is so exciting to hear how hesitation to blend and drink spinach has now become a daily routine. To anyone that is just starting out with Green Smoothies, I highly recommend that you add a frozen banana to each smoothie. Many of my Weight Watchers friends agree that a banana is essential to give the smoothie sweetness and make it creamy. Each week I buy three to four bunches of bananas. In addition to the banana that I toss into our green smoothies, Mike and I each eat a banana during the day. The rest I peel, break in half, and freeze when they get ripe. 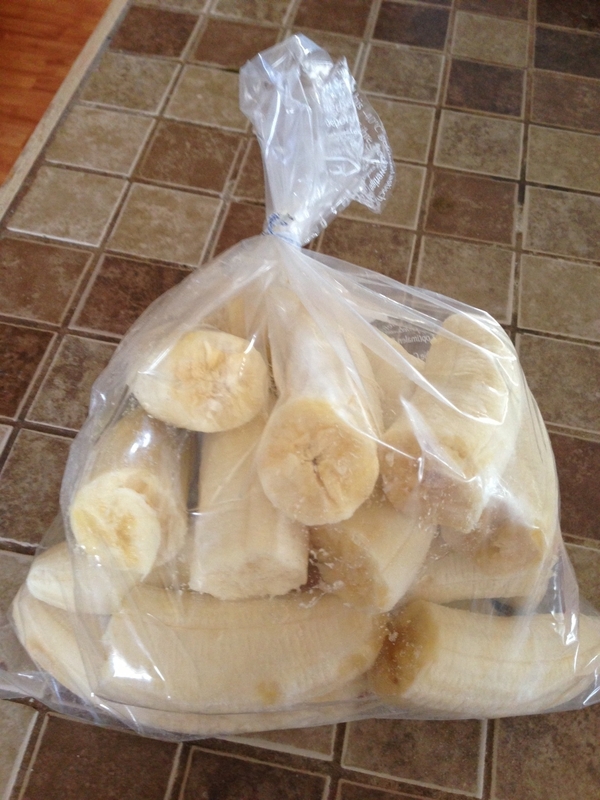 I like to freeze the bananas in a glass bowl but if I do not have much room in my freezer I use a bag. I have a Vitamix blender so I do not have a difficult time blending up the large banana pieces. If your blender struggles a bit with frozen fruit you might want to cut the banana into smaller segments. Green smoothies are not the only way that Mike and I consume our produce. A few years ago when I gave up meat, I found that Veggie Burgers were a staple that are essential to keep on hand. 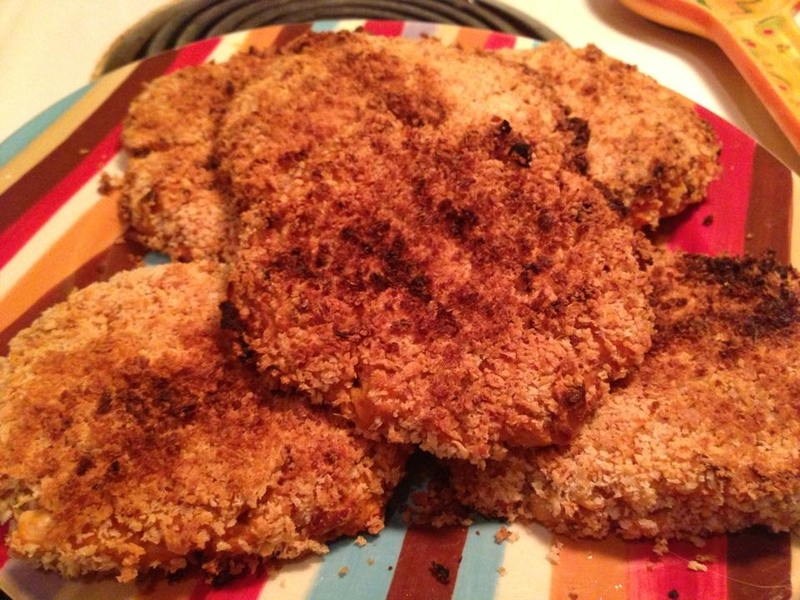 They are a versatile and quick meal ingredient and a great protein source. My favorite way to eat them is open-faced on a slice of toasted bread with all my favorite burger condiments piled on top (fried onions, my mom’s unbelievable dill pickles, ketchup, mustard, lettuce, and tomato). I serve veggie burger patties to Mike for breakfast in place of sausage and we also use them to top a salad. There are many different varieties on most supermarket freezer shelves but one look at the ingredient list makes me shudder. It has been one of my goals to find recipes for delicious and nutritious veggie burgers that I can make in my own kitchen. While I have yet to find a veggie burger recipe that stays as intact as a store bought version, that is okay. After all, I imagine that the mass manufactured veggie burgers are held together with some sort of heavily processed food additive substance that is better left out of my body. There are more serious things to worry about instead of a crumbly veggie patty. That is why forks (and fingers) were created. If you have to purchase a store bought veggie burger, I recommend this brand. 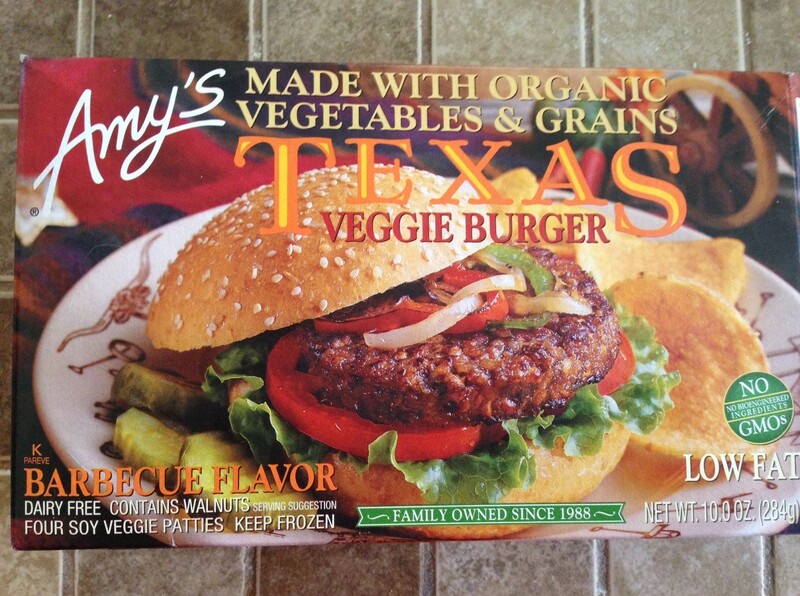 If I do buy ready made veggie burgers at the supermarket I try to buy the Amy’s brand. I can find them locally at Econo Foods and at the Marquette Food Co-op. They are quite tasty and more natural than others that I have found but they do contain soy which I try to consume in limited quantities. Recently I stumbled across an incredible blog called Healthy. Happy. Life. (The Lunchbox Bunch) that features 100% vegan recipes. I contacted the blog’s creator, Kathy Patalsky, and she gave me permission to share a couple of her recipes that I recently tried and wanted to share with my friends and fellow health enthusiasts. Kathy says this about her recipes, “…my vegan recipes are not just for vegans – they are for everyone. I love vegan newbies or those just experimenting with vegan recipes. Adding even a few plant-based meals a week to your diet is a great place to start.” I cannot agree with Kathy more. Saturday at my Weight Watchers meeting I found myself telling my group again that vegetarian and vegan cookbooks/blogs are a great resource to search for meal ideas. This week’s topic was fueling our bodies and our activity with WW Power Foods. During our meeting times together, so many of us share how we feel much more satisfied when we include protein rich foods into meals and snacks. Since vegetarians and vegans are experts at making sure their protein needs are being met, I always suggest seeking out these recipes for protein sources. The recipes can always be adapted and meat or cheese can be added for picky spouses or children. Though, I always suggest tricking them and serving up the recipes exactly as they are. For Kathy’s recipe, I used two 19 ounce cans of cannellini beans and two sweet potatoes. Since the oven was already on for another meal, I simply peeled the potatoes and wrapped them in foil and baked for approximately 30 minute at 400 degrees. The potatoes were soft and malleable and helped all the other ingredients stick together without having to use an egg. 2 Tbsp tahini (Tahini is a common ingredient for hummus and is made from ground sesame seeds. It also is a flavorful ingredient for salad dressings. It can be found in most supermarkets in either the health food sections or sometimes in the olive or salad dressing aisle. If you cannot find it ask an employee for help because it is a wonderful ingredient to keep on hand). 1 tsp Greek seasoning (Kathy recommends: lemon pepper seasoning, Cajun seasoning, or your favorite spice) I would imagine the cinnamon or nutmeg would also be a fantastic accompaniment to the sweet potatoes. Optional ~ scoop of nutritional yeast (I added 2 tablespoons. Nutritional yeast can often be found in the health food sections of the grocery store and it has a “cheese-like” taste. One of my WW members suggested using nutritional yeast to top popcorn and I also enjoy it on steamed vegetables) Kathy also recommends a few dashes of cayenne and black pepper and salt to taste. I added the pepper, salt, and some smoked paprika to the avocado that I put on top. Avocado, Dijon, and romaine lettuce to dress the buns or you can substitute your favorite condiments. However, I HIGHLY recommend the avocado and Dijon mustard because the flavor combination is unbelievable. Place peeled baked sweet potato in the bowl and mash into the beans. Coat patty with Panko (I put the crumbs on a plate and pressed them into the top and bottom of the patty)I also pre-measured out 8 equal amounts of the mixture so I would have even patties.Kathy recommends frying the patties in safflower oil. I did try to fry a couple in coconut oil and while they were tasty they did crumble and fall apart. The others I decided to put on a cookie sheet and baked at 350 for approximately 30 minutes. They turned out perfectly and really held their structure. Trust me, they are as delicious as they look! This burger is too pretty for a bun! Add a pickle, a side of tomatoes. A leaf of romaine, avocado, onion, Dijon mustard and you have a recipe for mouth watering goodness. You can serve without or without a bun. I like to serve on a slice of Ezekiel bread toasted. We ended up eating all of the Sweet Potato Veggie burgers this week. They kept well in the refrigerator for a few days and to prepare I simply put them under the broiler. Next time I will make a double batch and vacuum seal and freeze. I will try to freeze some that are already baked and freeze a few that are not baked to see which method works best. They would also keep for a few days “uncooked” in the refrigerator and baked for each meal. I thought of doing this but did not want to turn on the oven for just a couple veggie burgers. The broiler did the trick since they were already baked. Next time I would probably bake them for a little less time because I had to cover the top with foil since the patty was already quite brown and I did not want it to burn. I did take one to work and reheated in the microwave which made the veggie burger a little soggy. 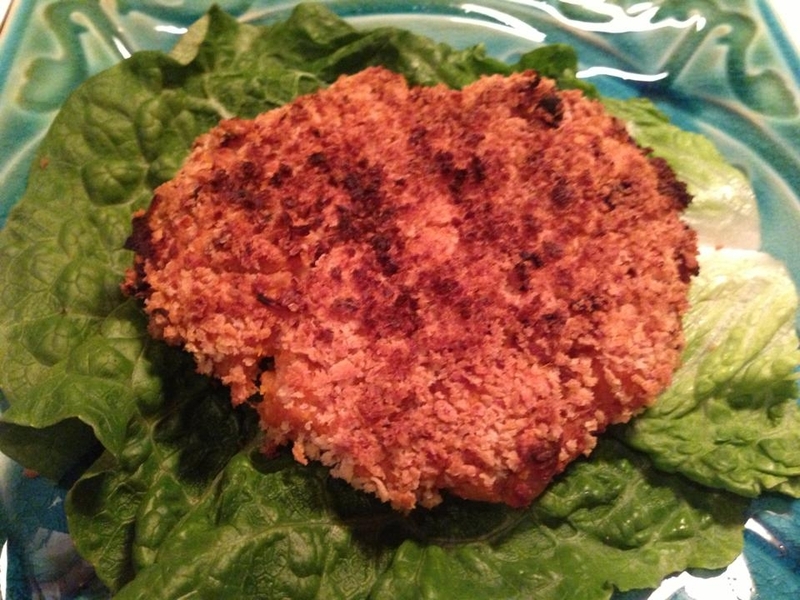 Last July I did find another veggie burger recipe that is pleasing. The original recipe belonged to Guy Fieri on Food Network. I changed up a few ingredients and was very pleased with the results. They have a nice texture and I have even made them quinoa in place of the oats. On the Food Network website someone suggested serving with salsa, tomato, cheese, lettuce, and sour cream (that it could even be served in a tortilla). I did the same with some Daiya crumbles and vegan sour cream. I jazzed them up with extra jalapeno and a drizzle of hot sauce. To get the patties to stick together I added olive oil, a couple Tablespoons of water, and ran them through the blender (I do not have a food processor). Ovo-lacto vegetarians could add an egg or two to the mixture to hold the patties together. I used a 1/2 cup measuring cup for portion control and the recipe rendered 5 patties at 7 PP each. 1 oz oil (to sautee vegetables) and 2 teaspoons to add to the mixture. In a medium saute pan over medium heat, add oil and all vegetables except beans. Saute until translucent. Remove and cool. Add veggies to beans and mix thoroughly. Add all dry ingredients. 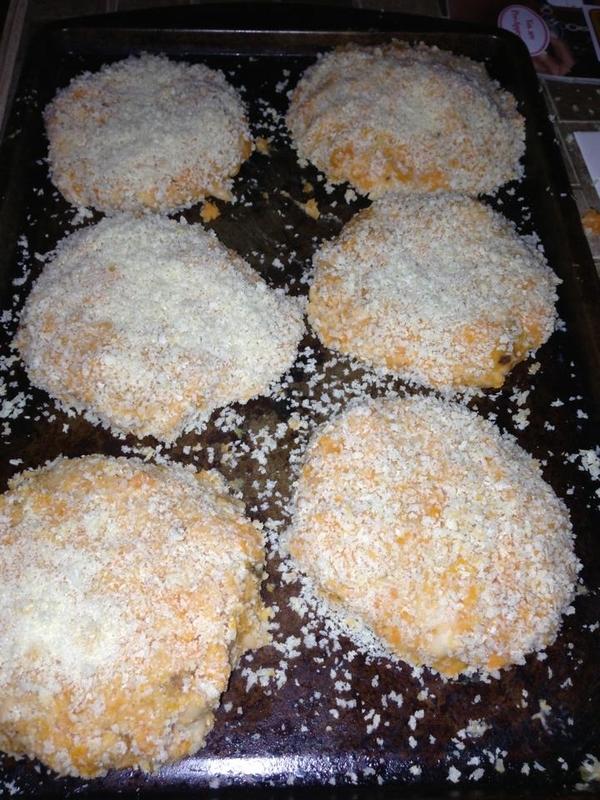 Thoroughly mix all ingredients and form patties, cover and refrigerate for 30 minute. In pan cook patties 2 to 3 minutes per side. They can be baked as well. I kept quite a few of the patties in the refrigerator and cooked them fresh for each meal. They also do freeze well. While Mike does eat meat and dairy, he is very open to vegetarian and vegan options. 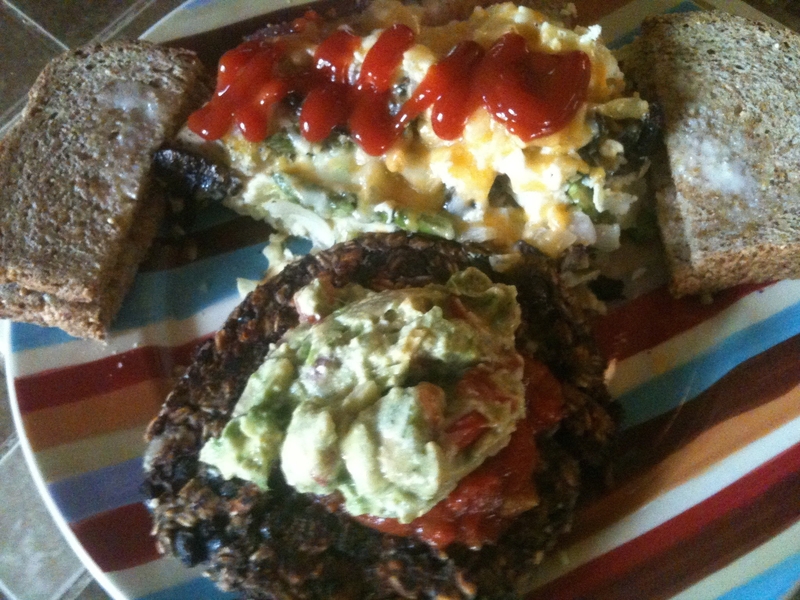 Here is the photo of a breakfast that I made for him in September using the black bean recipe that I shared. For those that are interested in plant-based meals but have family members that are not quite on board (Yet) there are ways you make adaptations without having to create separate meals. The veggie burger is a perfect example. Mike’s feast which was fit for a vegetarian king! Crustless quiche with mushroom, asparagus, potato, caramelized onion and garlic, fresh basil, and cheese. Ezekiel bread and homemade black bean veggie burger patty topped with guacamole brimming with garden tomatoes and cilantro and salsa. I hope that you found these recipes helpful. Let me know if you try them and what you think. 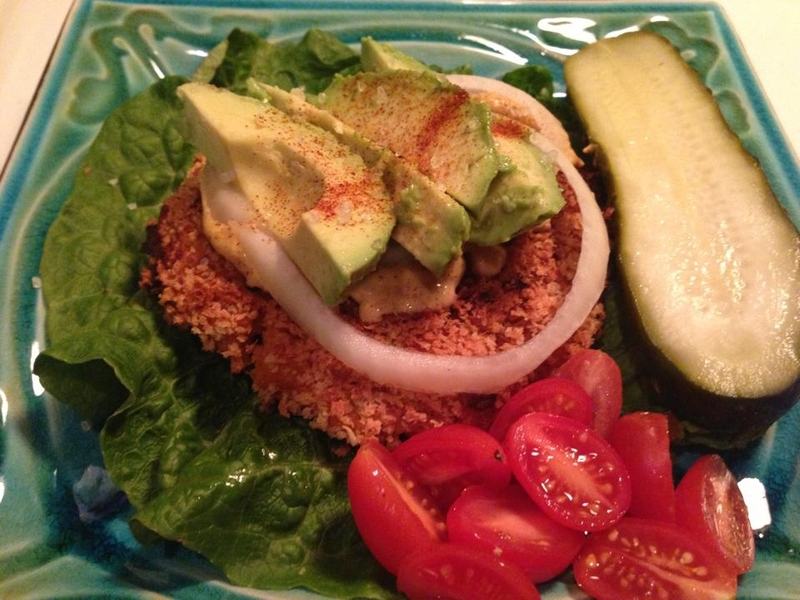 I would love to hear about your favorite veggie burger recipe. Thank you to Kathy Patalsky for her remarkable and compassionate vegan options. I highly suggest that you bookmark her blog and also like The Lunchbox Bunch on facebook. Your taste-buds and your waistline will thank you. Have a great week that is productive and full of fruit and vegetables. 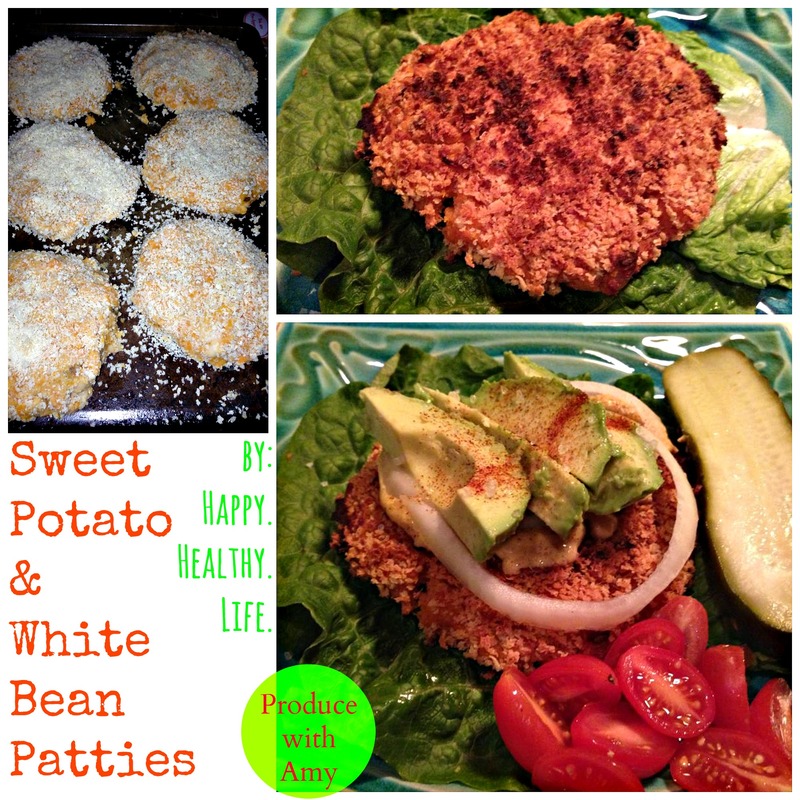 This entry was posted in Entree and tagged Black Bean Veggie Burgers, Sweet Potato and White Bean Veggie Burgers with Avocado, The Lunchbox Bunch, Veggie Burgers, Weight Watchers by Amy. Bookmark the permalink. Those look sososososo good. I wish I had more time to cook. Instead, frozen dinners for me. They have great weight watchers coupons over at PrintableCouponsandDeals.com! I use them to make the weight watchers food cheaper.